Everyone who plays golf knows that the driver hits the ball the farthest of any club. It also has the lowest launch angle, or "loft." Clubs with high loft, such as a sand wedge, pop the ball very high up in the air, but don't hit it very far. The universe of people who both play golf and also know college-level physics may not be very large, but everyone in this club has puzzled over this conundrum: why is it that a driver has a loft of only about 10 to 12 degrees? That seems far too low. Exactly 30 years ago this month, my uncle Herman Erlichson figured this out. It's the spin. He published the answer in a serious physics journal , but I'm guessing that most golfers don't read physics journals. So here is what he found. Everyone in freshman physics learns that the optimal launch angle for a projectile - the angle that makes a ball fly the farthest - is 45 degrees, in a vacuum. But in the game of golf, 45 degrees is the angle of a pitching wedge, which (as every golfer knows) hits the ball only a short distance, about half as far as a driver. 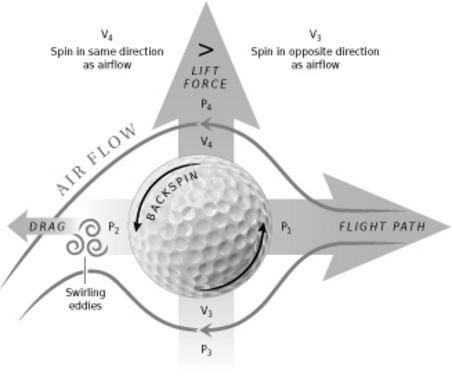 The analysis itself is technically very complex, involving 3 forces: gravity, drag (resistance caused by air friction), and lift, caused by the backspin on the ball. All three are big factors, but the theoretical result of 45 degrees only accounts for gravity. 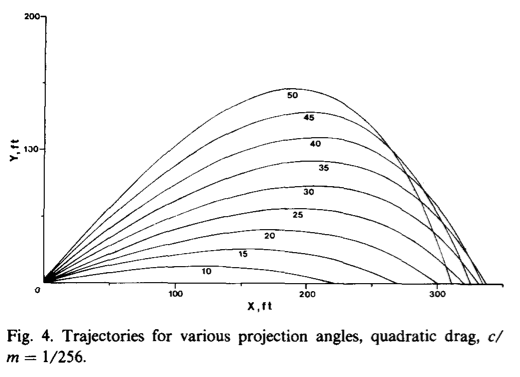 One consequence of "quadratic drag" is that hitting the ball a lot harder only yields a modest increase in distance. More important, though, is that if we just consider gravity plus drag, the best angle to launch a golf ball is 35 degrees. Lower than 45, but still nowhere near the angle of a modern driver. And the distance here is still too low, only 336 feet (112 yards). After accounting for lift, the optimum angle is 16 degrees, and the ball flies about 200 yards. (This assumes a typical launch speed by the standards of 1983. The much longer drivers used today create a much greater speed off the tee.) The remaining different between the actual loft of 10-12 degrees can be explained by the fact that for a drive, the teed-up ball is struck just past the bottom of the swing. This makes the launch angle slightly higher than the loft of the club. There you have it: when you account for all the forces at play, the optimum angle for a golf driver really is around 10-12 degrees. My uncle Herman Erlichson loved the game of golf and played often, despite having a seriously weakened leg, the after-effect of a polio infection that he contracted in the 1950's. He might have struggled to master the game itself, but when it came to the physics of golf, he solved a mystery that had puzzled physicist-golfers for decades. H Erlichson. 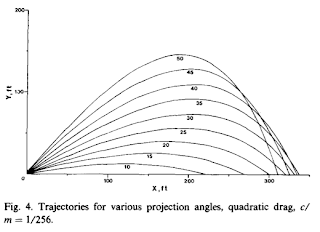 American Journal of Physics 51:4 (1983), pp. 357-362. For all 95 of Herman Erlichson's scholarly papers, including his paper on the physics of golf, see his Google Scholar page. With the Supreme Court about to hear a landmark case on gene patents, Myriad Genetics, the company that owns the patents under scrutiny, is going on the offensive. I've written about this case before, when the patents were first thrown out by one court, and then restored by another. Now the Supremes will have the final say. Just last week, geneticists Jeffrey Rosenfeld and Chris Mason wrote a commentary for the Washington Post that warned about the consequences of companies owning the rights to our gene sequences. Today, in a letter filled with non sequiturs and distortions, Myriad Genetics' CEO Peter Meldrum, worried about whether his company will be able to maintain their monopoly on a test for which they charge $4000, responded. Let's look at his claims. "Thanks to these patents, you can’t look these genes in your own body without paying a fee to Myriad. Sounds ridiculous, right? Well, that was the state of gene patents until last May , when judge Robert Sweet ruled that the Myriad’s patents were invalid." Myriad appealed the decision, and the appeals court overturned Judge Sweet, buying into the argument by Myriad's lawyers that "isolated DNA" is not the same as the natural DNA, and that this distinction allows companies to patent it. This is scientific nonsense for many reasons: for one thing, the process of isolating DNA does not create an artificial molecule. The body's own cells isolate DNA all the time, in the process of turning it into proteins. But the appeals court accepted the argument, perhaps just because they wanted to uphold the patents. So now the Supreme Court will re-examine this scientifically ridiculous claim. "were essential to developing diagnostic tools that have been used by more than 1 million women to understand their hereditary risks of breast cancer and ovarian cancer." This claim is simply false. Myriad's patents made no contribution at all (and certainly weren't "essential") to the diagnostic tools used to detect mutations. I know something about these tools, which I've been using in my own research for over 15 years. Furthermore, academic medical centers were offering their own diagnostic tests on the BRCA genes, at a lower cost than Myriad, until Myriad's lawyers forced them to stop. So Myriad's patents have increased costs to patients and, if anything, slowed down progress on making the tests faster and cheaper. "Were these molecules derived in part from natural material? Sure. But that is true of many patents. Labs routinely turn naturally found molecules into innovative medicines and get patent protection." One's jaw drops at this irrelevant non sequitur. Myriad has never created "innovative medicine" or any other sort of medicine. And the BRCA gene tests are not medicine: they are a diagnostic test that reads your DNA and tells you if you have harmful mutations in two specific genes. Myriad's patents have nothing to do with medicines that treat breast and ovarian cancer - although it's clear that Meldrum would like us to think otherwise. "Our tests are also accessible; some 95 percent of patients get insurance coverage, and we offer the test for free to those who cannot afford it." This too is irrelevant, and also untrue. The fact that 95% of patients have insurance, even if true, has nothing to do with whether or not genes should be patented. And this merely hides the fact that Myriad's test is outrageously overpriced, at $4000 per patient. The actual costs of testing for this gene should be far lower: we can now sequence an entire genome for $4000, and this test only looks at 2 genes out of more than 20,000. Meldrum also throws out the unproven claim that Myriad offers it for free to those who cannot afford it. Really? Who decides if someone can afford it? If a woman can scrape together the $4000 with great hardship, does Myriad give her a break on the price? I doubt it. And what does this have to do with Myriad's supposed right to own your genes? "Our patents have also promoted additional research; 18,000 scientists have studied the genes, resulting in 10,000 published papers." This is just unfounded bragging. Even the most wildly successful scientists would be very careful about claiming that that 10,000 papers have been based on their work. In the case of Myriad, this is just false. If you do a PubMed search for BRCA1, you can indeed find over 9,600 papers, as I did today. However, there is no evidence whatsoever that these papers were even remotely supported by Myriad's patents. 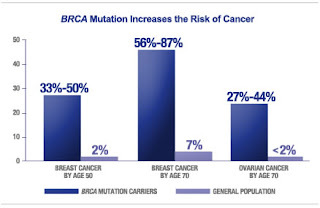 It is far more likely that the patents prevented additional research on the BRCA genes. The vast majority of research on these genes was supported by the public, which in the U.S. means by the National Institutes of Health. Meldrum's boastful claim is absurd. It's worth noting that the original paper describing the link between BRCA1 and breast cancer was published by a multi-institutional team from the University of Utah and other places, who were supported by multiple grants from the NIH and from the Canadian government. Myriad Genetics subsequently licensed the patent rights from Utah, and has used them ever since to maintain its monopoly and prevent others from developing tests on the BRCA genes. To claim that its patents promote innovation is pure nonsense. The bottom line is that no one invented your genes, and no private company should be able to tell you that you can't even read your own DNA. Today, you can get your DNA sequenced for less than the cost of the Myriad test. Using free software (developed by my lab), you can scan that DNA for mutations in BRCA1 and BRCA2. And no company should be able to tell you not to. Peter Meldrum's letter reveals that he doesn't care very much about the truth. Meldrum made $4.87 million in 2011 as CEO of Myriad, so it's pretty clear what motivates him. Myriad's use of its patents to charge exhorbitant prices to women at risk for breast and ovarian cancer does not demonstrate innovation. It just demonstrates greed. Mehmet Oz hosts a popular TV show that reaches millions of people. He offers a constant stream of medical advice, and he is popular because he makes his topics sound dramatic, or exciting, or surprising, or all three. Unfortunately, Dr. Oz sometimes has a poor understanding of science. At least I hope so, because he promotes so many outrageous treatments, with such enthusiasm, that the only other explanation I can think of is that he is simply a fraud. I don't think that's true, so let's give him the benefit of the doubt and assume that when he makes a mistake, he is simply ignorant of the truth. His latest startling revelation is that the metal fillings in your teeth are very, very bad for you. Or are they? Last week, Dr. Oz hosted a show called "Toxic Teeth: Are Mercury Fillings Making you Sick? The show looked at silver amalgam fillings, which contain a small amount of mercury chemically bound within them. Mercury is indeed a toxin. Should you worry? One problem with taking a skeptical look at a Dr. Oz show is that he packs each episode with scientific claims, coming at you thick and fast, and it would take hours to critique them all. Instead, I'll just pick a few, which illustrate Oz's lack of concern for accuracy, and his apparent ignorance of the underlying science about dental fillings. "This thermometer contains mercury," he says, holding up a very small thermometer. "If I were to drop it, we would have to evacuate this entire studio immediately!" This opening salvo should set off anyone's skeptical alarm bells. Here's a guy who doesn't seem to mind exaggerating to make a point. Why trust anything he says in the rest of the show? I suspect, though, that after watching this episode, thousands of Oz's loyal viewers raced to the phone and made appointments to have the silver fillings in their teeth removed. "sparked a firestorm 30 years ago [here the show cuts to a graphic of a fireball exploding] when major news reports brought to light the potential TOXICITY of mercury fillings. ... Now there's mounting new evidence showing mercury is released when you eat, and even when you brush your teeth." Quick, run to the dentist! Get this toxic mess out of my mouth! "for the first time ever, I'm going to show you what happens when you brush your teeth with mercury fillings." No, this is not the "first time ever." As a scientist, I find it worrisome that Oz seems quite comfortable claiming, incorrectly, that he's the first person ever to tell the world about this. Perhaps the most outrageous - and unintentionally funny - segment of the show is the "demonstration," where Oz introduces an Oz-certified expert on mercury vapor, David Wentz, who has a gizmo that looks like it was built by a sideshow huckster. The device is a plexiglass box that looks like it was meant to handle biohazards, with black rubber gloves that let you manipulate its contents. In the box: a set of fake teeth containing... silver fillings! And a toothbrush! As he walks over to the device, Oz says "I work with Dave Wentz and his Ph.D. dad." This goes by really fast, so you would be excused for not realizing that Dave Wentz himself doesn't have a Ph.D., and for not knowing whether he has any credentials at all. Dr. Oz conveniently omits the fact that Wentz and his father run a highly profitable nutritional supplements company, USANA http://www.usana.com/dotCom/about/index, which happens also to donate money to Oz's nonprofit corporation, HealthCorps. Hmm. Dr. Oz then reaches into the box, and while the audience watches in hushed excitement, he brushes the teeth, right on top of those silver fillings! Right on cue, Wentz proclaims that the mercury vapor reading hits 61 in just a few seconds. "Anything over zero is toxic," Wentz proclaims. "And we're at 61." "Oh my goodness, 61!" Dr. Oz exclaims. "That mercury is coming off the fillings, into your mouth, going across the blood-brain barrier, into your brain," says Wentz dramatically. Wow. I've been brushing my teeth (which have several fillings) for years. How can I not be dead? As Dr. Oz should know, "the dose makes the poison." Even water can kill you if you drink too much of it. Wentz is clearly wrong to say that "anything over zero is toxic." How much mercury is safe, then? According to the EPA, 0.1 micrograms of mercury per kilogram of body weight per day is safe. For an adult who weighs around 150 pounds, that's about 7 micrograms. A 6-ounce can of tuna has about 20 micrograms of mercury, about 3 times the safe amount per day. Scientists do have real concerns that mercury in tuna and other fatty fish might present a health hazard. Dr. Oz's device seemed to show that 61 micrograms of mercury were released from brushing teeth, which would be about 9 times the exposure that is considered safe. Is there really a risk here? "The current data are insufficient to support an association between mercury release from dental amalgam and the various complaints that have been attributed to this restoration material. ... Individuals with dental amalgam-attributed complaints had neither elevated HgU nor increased prevalence of hypersensitivity to dental amalgam or mercury when compared with controls. The findings of these studies suggested that individuals with complaints self-attributed to dental amalgam should be screened for underlying dental, physical, and psychiatric conditions." So no, there's no evidence that mercury from silver fillings causes any health problems. None. But what about that device on Dr. Oz's show, which showed 61 micrograms being released in just a few seconds of brushing the teeth? My conclusion is that the device in Dr. Oz's studio was either wildly inaccurate or simply fraudulent. The setup was almost a parody of what real scientific instruments look like, and nothing about it gave me any confidence that it was reliable. I would suggest to Oz that before making a claim like this, he should ask rigorously trained scientists to make the measurements using properly calibrated equipment. A TV studio is no substitute for a real lab. But wait: Mehmet Oz is a Professor of Surgery at Columbia University - he must know his science! Plus he has an M.D. from the University of Pennsylvania, and he did his undergrad studies at Harvard. By all appearances, he is a very smart guy. If his show were about heart surgery - his specialty - it would no doubt be professional, accurate, and probably far too technical to attract an audience. Here's the rub: despite his credentials, Oz is not an expert on mercury amalgam fillings. He probably could have read and understood the science, but he appears to be unaware, or too busy to be bothered by, the many scientific studies on this subject. Had he done his homework, he might not have presented such a spectacularly overblown episode that seems intended to scare people into removing the silver fillings from their teeth. So there's no need to go out and get your silver fillings replaced. It's too bad that a highly educated surgeon like Mehmet Oz, with such a big audience, prefers to present wild exaggerations rather than telling people the truth. Perhaps, though, the truth just isn't that exciting. *Note added on followup: Even swallowing is rarely harmful. From J. Dodes: "Acute toxic exposures to elemental mercury are rare but there have been cases of elemental mercury being accidentally released directly into the bloodstream from broken rectal thermometers and when elemental mercury had been swallowed intentionally in an attempt at suicide. In all these cases there was no long-term effects from the mercury." Dodes, JE. 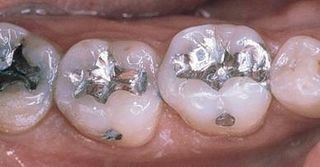 The Amalgam Controversy:an evidence-based analysis. JADA, 132:348-56, 2001.